I don’t have a lot to say about yesterday’s bizarre Goebbelsian spectacle with Diosdado Cabello (of all friggin’ people) accusing Primero Justicia of widespread corruption except that it confirms my earlier hunch that post-Chávez era is poised to substitute repression for the money, charm and personal authority Chávez had and Maduro/Diosdado don’t. Just for the record: the notion that corruption is more widespread in the opposition than in the government is patently insane. Imagine you’re a greedy, amoral young pol out to line your pockets in public life: which side of the political divide would you go for? The one that controls all the courts, all the prosecutors, all the public media, and $100,000,000 a day in oil revenue, much of which is spent with no oversight, no accountability, not even a budget? Or the penniless side that controls virtually no public funds, is intensively spied on and incessantly harassed by investigators, that can’t raise money openly because its backers are scared of the persecution they’ll face if they play ball and that’s constantly pilloried across a sprawling and growing state media apparatus? 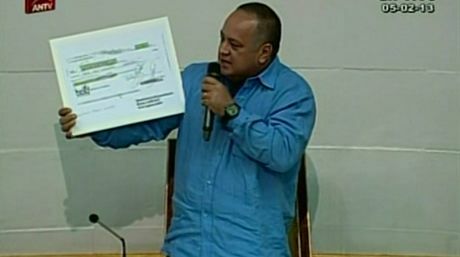 You need to be very far gone down the chavista propaganda rabbit hole to take yesterday’s show seriously, or hell, to suppress the giggle response as you hear Diosdado Cabello acuse anyone of corruption. But faced with an openly repressive authoritarian state, giggling is likely to be in short supply in years to come.